Sandra Kaye: Come On Everyone Let's Trade!! Come On Everyone Let's Trade!! #1- Make four quilties. Measuring 4x6 inches. You will only get 3 back. The extra quiltie is for your return postage. I have been having issues with incorrect return postages both in the country and out of the country. So, I propose you make me an extra quiltie as your return postage fee. #2- Please grab my new I'm Trading Quilties button, and place it on your blog. The faster we can spread the news of this trade the more players we can get. #3- Mail four quilties to my home. #4- Get three different quilties back. So there you have it -- Easy Peasy!! -- the next photo's are on how to make a quiltie. You need to start with three layers. A backing fabric, batting or felt, and your top piece. On this quiltie I decided to use a pre-printed fabric I love. But, your tops can be pieced, painted, appliqued, or even a sadly unused block that didn't make it into a quilt. Whatever makes you Happy!! The size of all your quilties should measure 4 inches by 6 inches (4x6). Please stick to this size. I have several ideas of what to do with these quilties once you have a good collection. But, I need them to be all the same size. It doesn't matter which way you lay them out, horizontal or vertical. 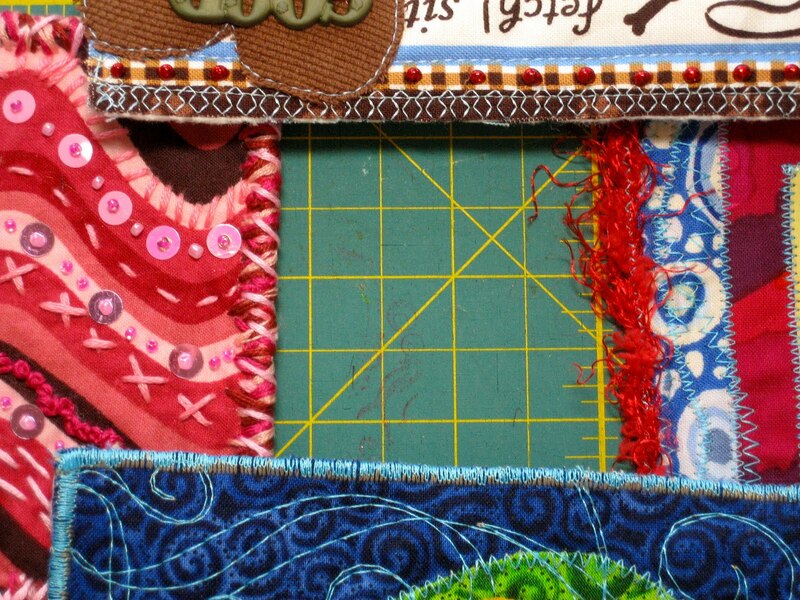 Next , hand or machine quilt all your layers together. Here is my finished quiltie. I really LOVE doggies!! You can use any medium of your choice. But, fabric should be the base of all your quilties. For those of you who have a hard time starting without a guide line. I will give a guideline for each trade. I will have a theme or product I want to focus on. 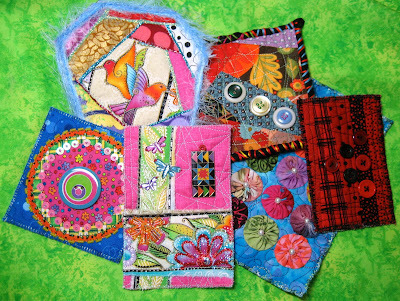 Your quilties can all be the same, or you can make each one different. That is completely up to you. One last note--- Leave me an email or comment that you are joining the trade. At that time I will email you my address. I will also give updates and reminders here on my blog. I will do a post of all the traders and a link to their blog. The theme of this trade is FLOWERS. You can use any kind of flowers, buttons, ribbon, paint, fabric...the list goes on. The mail out date is April 15th, 2012. If you are from another country.....you will need to mail out 2 weeks sooner. I will only wait one week after mail out date to trade and return all quilties. So, if you know your mail will take longer PLEASE mail sooner. Remember, it doesn't matter what your skill level is, from newbie to experts. We are all here to have super fun and get to know each other. So, come on every one let's trade!!! OK, you convinced me! Looking forward to my creativity. Hi Sandra! Thanks for stopping by my blog! So nice to meet you, and I love your quilt art and blog! Finally a quilt I can finish! This will be so much fun! Buttons, buttons, how I love them and collect them. ♥ Count me in...I'll put your badge on my sidebar and I'll also do a post to encourage others to join. If everyone would do a post it would really help build the amount of participants. oh Yes ! I'm in. Send me your address oh Colorful One and I will send you some quiltie love. Thanks for coming to my blog - cause now I'm ended up seeing yours and following you! I love these little quilties and want to play. But later, because right now if I add one more thing to my do to list I'll explode. So many in a month or two. I love the dog quiltie and the sewing machine and the...well, you get the picture. LOL!! I found you thru Queen of dreams. thank you so much for the invitation! I love the little quilties and especially love yours, as I love dogs too! yes, count me in! I will be on the look out for cute buttons on my Shop Hop tomorrow! Thanks so much! Thanks for your comments on my blog Sandie, it warms my soul to connect in more than one way with someone...artsy, quilty, most importantly, spiritually. On to the quilties...I WANT to make quilties. I'm scared to commit because I have so much on my plate but I'm putting it on my calendar now and giving myself a week to get projects under control. If I'm still drowning here, I'll let you know by then. Thanks for the invite! 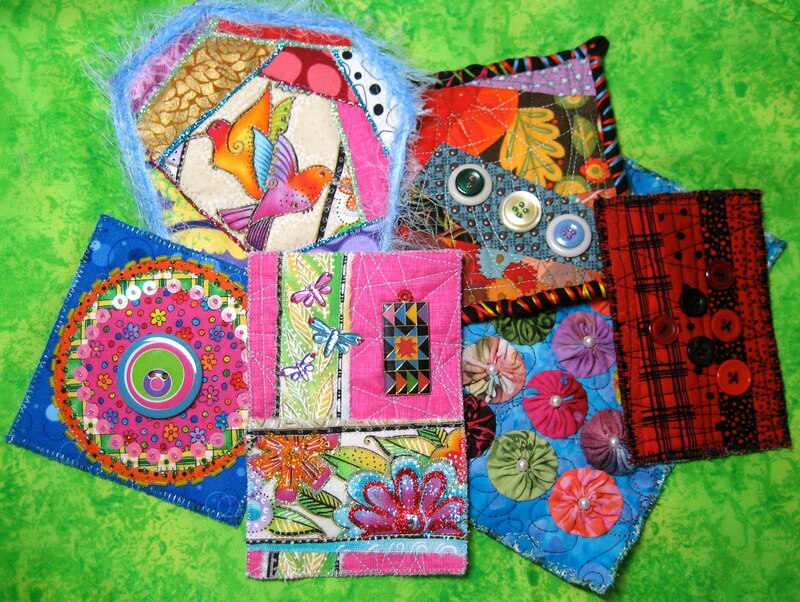 Okay Sandie, one of these days I am going to have to give making quilties a try. Every time I see yours I start drooling. Love the dog one of course! I used to make a lot of pillows and have been wanting to start making them again. I like to do so many things and not enough time to do them all. I want to thank you SO MUCH for being the first one to join my site. ThankYou-Thank You!! 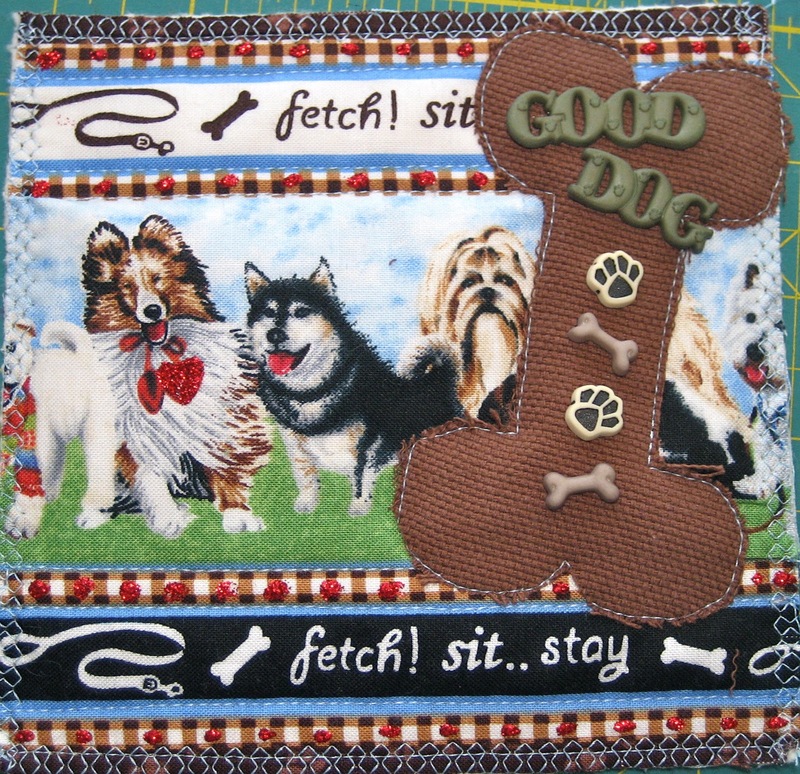 I found your blog thru Barb's blog, A Corgi to Quilt By and I am interested in doing a set of quilties for trade. I'll let you know when I get them done and if it's before Oct. 15 I'd like to partipate in your fun swap. I'm ready to go...a little late to the gate, but I will meet the deadline! Thanks for the opportunity...now back to my quilties! Missed this one, will you be hosting another swap? ARE YOU GOING TO DO A QUILTIE SWAP AGAIN!!!! This sounded like so much fun! YEA! So excited, will try to make the Dec 15 deadline. What's the theme??? My email is down right now, but it is ferrellphotography2007@yahoo.com or u can blog me. I am new to blogging and this seems easier for me than the other swaps. I am an art major. I have 5 doggie "kids." 4 Weiners and a Rottie-mix. I love quilting, i am back into the groove and have some scraps from grandparents and auctions....... would love to put them to use!!! I originally have been looking for small quilts because my 2 year old niece wants "pretty blankies" for ALL of her babies. And i am trying to make some for Christmas for her, and use up some of my stash!!! I am in I believe my mom is also. I will get back with you on her. Is it too late to join in for your December 15 quilties trade? It looks like so much fun! Can i be in the next quiltie trade??? Mixed Media Show and Tell!! Blogger's Block of the Month!!! My ATC Love Affair !!! I love it when I get something done! !